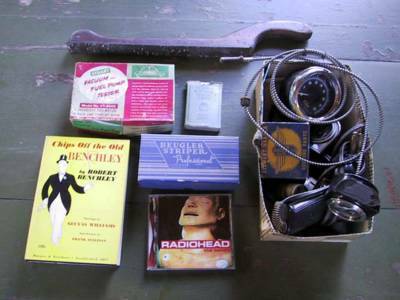 At first blush, it appears to be a slightly better than average day of garage saling. Big deal, another Robert Benchley book and a third copy of The Bends. Some gauges, a recent Sun Tachometer, a set of marked playing cards... but the Stewart Warner box looks promising even though they are usually filled with nuts and bolts.